If you want to become successful in the music industry, there are many things you need to know and do. You also need to know what NOT to do, so you avoid critical mistakes that can hurt your music career and keep you from becoming very successful. Doing the wrong things can hurt your career even if you do everything else right. A single error in judgement can undo years of hard work you invested into building your career as a pro musician. Take advice of people who have never been professional musicians (more about this below). Have you ever heard the saying: “You never get a second chance to make a great first impression”? This is very true in all areas of life, including the music industry. “Getting your name out there” can hurt your career if you are not yet ready to be seen and heard. If a record company executive decides that you (or your band) are not ready for a record deal, what do you think will happen in 6 months (or years) when the same company sees/hears from you again? Answer: they remember their first impression of you and don’t consider you for potential opportunities. They don’t give you a second chance, because there are endless other bands and musicians to pay attention to. Having financial and situational freedom to pursue opportunities when they come up. Example: are you able to drop what you are doing tomorrow and work in a studio for 12 hours per day for 4-6 weeks? Can you go on tour (without getting paid) for 2 months in another country? If you cannot do those things, you aren’t yet ready for big opportunities in your music career. Having the right mindset and world view that is consistent with what record companies look for. There is a lot more that goes into it than you probably think (more on this below). Having a large database of your fans. If you don’t know who your fans are (and how to contact them), it is hard to convince record companies that they should invest into your career. Knowing how to convert your regular fans into super fans who buy your music, come to all of your shows and support your music career financially. Answer: Music fans will happily buy your music when you show them why they benefit a lot more if they pay for it versus downloading it illegally. It’s actually not that hard to sell music to your fans, once you understand the way music industry works today (versus how it worked 30 years ago). Read this free eGuide to learn how to get your fans to buy your music. Your social media profiles are only 1 piece of the online music marketing puzzle. Record companies are a lot more impressed by the traffic you (or your band) get to your personal website. Why? Because you cannot fake traffic to your personal website as easily as you can purchase fake Facebook “likes” or YouTube channel views & subscriptions. Record companies know this and they look carefully to check how much traffic your website is getting. Social media marketing is still important in the music industry… but it cannot be the main thing you rely on to promote yourself. To become successful in the music industry, treat your career like a business. You should still practice your instrument, but your music career must take priority. The people you spend a lot of time with have a direct influence on your mindset & success. What do you think happens when you are around people who are: lazy, lack ambition, tell you why you cannot become successful and try to talk you out of pursuing your dream? Answer: your mindset goes in the toilet and you begin to doubt yourself and your potential. Seek out people with the mindset of a champion and spend as much time as possible with them. This strengthens your own mindset and makes you more likely to succeed. Avoid toxic people who weaken your mindset, desire and drive. Want to impress record labels, your fans and any band you plan to addition for? Learn how to put on a REAL show and blow your audience away every time you perform live. Being great in this area puts you far ahead of most other musicians and helps you get new opportunities in your music career much more easily. Read this article to learn how to improve your live shows and attract a lot of people to every gig you play. The number of fans you have should always be your secondary focus (not your primary one). It is not enough to simply have a lot of people like your music. You need to convert your existing fans into raving fanatics of you, your band and everything your music represents. This is particularly true in the beginning of your band’s music career. Your most loyal fans (fanatics) are going to come to your every show, buy your every album, buy your merchandise and help you acquire new fans through powerful word of mouth. All of this grows your music career like a bodybuilder on steroids. Like it or not, it takes money to build a music career. Even if other people/companies are paying for your record, tour support and merchandise, you still need to have the financial freedom to pursue opportunities as they come. If you have financial problems, you will miss many opportunities because you cannot afford to take advantage of them. That is VERY frustrating! In addition to a decent income, you also need to have freedom of time to commit to new projects, work in the studio, go on tour and do other things that grow your music career. 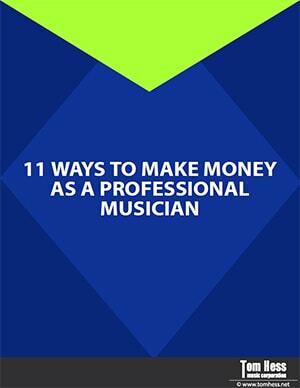 Want to learn many ways you can easily earn money as a pro musician? Download this music career income cheat sheet (it’s free & you don’t have to enter an email address). Print it out and study it, so you know what options you have for increasing your music career income. To be successful in the music business, you need to have a total package that integrates your music, your image and your visual stage show in a congruent way. When you have a compelling and congruent image, record companies begin take you a lot more seriously. This means you have a much easier time getting a record deal and attract opportunities that other musicians (who don’t have such an image) do not get. Ever heard the expression, “It’s not what you know, it’s who you know.”? In music, this is often modified to, “It’s not who you know, it’s who knows you.” Fact is, it’s not about either. To become really, really successful in your music career you need very deep relationships with important people and companies in the music industry. You don’t want to simply know people or be known. You want people who know you to have a real deep connection with you, so that you are always on the top of their mind when opportunities present themselves. Here is how to make it happen: focus less on networking and trying to meet as many people in the industry as possible. Instead, focus on a handful of relationships and look for ways you can add value to their life or business. Ask yourself, “what are the goals of these people and how can I help them achieve them?”. Want to understand how record companies work in a simple way? Think of a bank that lends money to people or small businesses. A record company works very much the same way. A bank loans you money to start a business, so you can pay the money back later (with interest). A record company invests money into your music career, so you can become successful and they can earn a return on their investment later (with interest). Learn the specific steps to take to begin a successful career in music. can have a successful music career. Learn how to REALLY build helpful relationships in the music industry. How much value you bring to them right now. How much they have to risk right now by working with you. How much potential value and risk might you bring to them in the future after they invest in you. Prove to record companies that working with you is the smartest investment they can possibly make… and you will get opportunities other musicians can only dream about. Imagine you are trying to navigate through the jungle… would you prefer to roam wildly and hope to survive on your own? Or would you feel safer with a proven guide to follow every step of the way? The answer is obvious… and navigating the music industry is no different. It is virtually impossible to achieve long-term music career success on your own. Your odds of making it go way up when you are guided through the process by a proven music career mentor. When you do what unsuccessful musicians do, you get the same result that those musicians get - failure. Want to build your music career faster? Learn the strategies that are proven to work and follow them. Be careful about taking advice from friends and family who know nothing about the music industry. When you listen to the wrong advice, building a successful music career becomes virtually impossible. Your music degree only means that you (probably) have good musical skills. However, your musical skills are only one of many elements that record companies look for in you. Thousands of musicians probably have musical skills just as good (or better) than yours. The easiest way to become really successful is to excel in areas other musicians lack. Fortunately, this is not very hard to do. Most musicians only focus on improving their musical skills and self-sabotage their music career in other ways. You can create music career opportunities for yourself no matter where you live (especially in today's world) and you can find professional musicians in every city in the world. When you worry about the city you live in, you waste a lot of energy that could be used on building your career and becoming more successful. Now that you know what mistakes hurt your music career, your next step to becoming a professional musician is to learn how to get your fans to buy your music. This helps you earn a lot more money in the music industry and do what you love without working a day job you hate. Read this eGuide to learn how to get your fans to buy your music.